Aerogel is the lightest solid on Earth. Often called a solid smoke because of its transparent, hazy blue appearance, the silica substance is used for insulation aboard space craft and as a collection device for interstellar and cometary dust. The JetPropulsion Laboratory has beaten itself into the Guinness World Records, againfor creating the world's lightest solid. Described asa solid smoke because it's 99.8 percent air, the material called Aerogel isactually a stiff foam made from silicon dioxide and sand - the same ingredientsthat make glass, but Aerogel is one thousand times lighter. Its densityis just 3 milligrams per cubic centimeter, 2 milligrams lighter than theprevious world record holder, an older formulation of Aerogel. This Aerogelis more than just lightweight. It withstands pressure thousands of times higherthan its own mass, and melts only when temperatures hit 2200 F (1200 C). 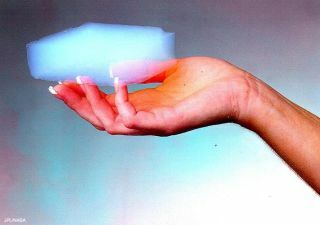 ScientistSamual Kistler invented the original Aerogel, in 1932. Monsanto bought therights to the material and underutilized it as an insulator in picnic coolersand as a thickening agent in napalm bombs. JPL realizedthe properties of Aerogel made it ideal for space-travel and it has been usedon the Mir Space Station as well as on the Mars Pathfinder missions. It is nowbeing used to collect tiny cosmic particles on the Stardust spacecraft. Aerogel isacting as a cometary dust-bin for the craft, which was launched in Feb 1999. Sofar, Stardust has collected several samples of stellar dust, and will encounterComet Wild 2 in 2004. Stardust'sAerogel collection unit will return to Earth in 2006 with the world's firstsamples of cometary dust - and the only space matter brought to Earth otherthan from the Moon. Scientistsare interested in the dust because comets are the oldest, most virgin materialsin the solar system. Learning more about them will make for a more completepicture of Sun and planetary evolution. It takes anout of this world material like Aerogel to capture a comet. The dust ofComet Wild 2 will fly off of it six times faster than a rifle bullet. Materialsthat get in the way of such particles are usually destroyed, or the impactobliterates the dust itself. One comet-spying craft, CONTOUR,is covered in the bulletproof material Kevlar, to shield against such impacts. ButStardust's Aerogel unit will act as a gentle catcher's mitt. Because Aerogel isonly 0.02 percent matter, it will gently put the brakes on the dust of CometWild 2. Finding the cometary bits in Aerogel will be as easy as following thecarrot-shaped trails that the grains will leave in the material. The newestAerogel, although not used in any spacecraft yet, is likely to hold the titleof least dense material for a good while. The creator of the record-breakingAerogel, materials scientist Steven Jones, believes that a limit has beenreached in eliminating silica from the formula. "It'sprobably not possible to make Aerogel any lighter than this because then itwouldn't gel," Jones said. "The molecules of silicon wouldn'tconnect." More JPLaccomplishments are likely to appear in Guinness World Records. JPL softwareengineer Ron Baalke said that after he saw the Aerogel in an older record book,he made a quick call to Jones to see if the material had been made any lighter.Baalke then added the new Aerogel density to a submission list of 59 other JPLachievements he'd been compiling for Guinness. "I was alwaysinterested in space history," Baalke said. Now, he's making some of hisown.